Peptide (C)HQPSLDQPAIPSSKAT, corresponding to amino acid residues 413-428 of rat TRPV2 (Accession Q9WUD2). 1st extracellular loop. Human - will not recognize the human epitope. Specificity Will not recognize the human epitope. 1,2. Guinea pig Anti-TRPV2 (VRL1) (extracellular) Antibody (#AGP-033), (1:2000). 3,4. Guinea pig Anti-TRPV2 (VRL1) (extracellular) Antibody, preincubated with the control peptide antigen. Cell surface detection of TRPV2 in intact living rat basophilic leukemia (RBL) cells. A. Extracellular staining of cells using Guinea pig Anti-TRPV2 (VRL1) (extracellular) Antibody (#AGP-033), (1:100) followed by goat anti-guinea pig-AlexaFluor-488 secondary antibody (green). B. Live view of the cells. C. Merge image of A and B.
Montell, C. et al. (2002) Mol. Cell 9, 229. Moran, M.M. et al. (2004) Curr. Opin. Neurobiol. 14, 362. Gunthorpe, M.J. et al. (2002) Trends Pharmacol. Sci. 23, 183. Tominaga, M. and Caterina, M.J. et al. (2004) J. Neurobiol. 61, 3. Voets, T. et al. (2004) Nature 430, 748. Pedersen, S.F. et al. 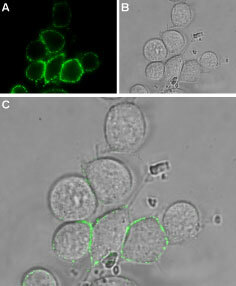 (2005) Cell Calcium 38, 233. Muraki, K. et al. (2003) Circ. Res. 93, 829. Shimosato, G. et al. (2005) Pain 119, 225. Saunders, C.I. et al. (2007) Mol. Immunol. 44, 1429. Caterina, M.J. et al. (1999) Nature 398, 436. Immuno-colocalization of SERCA1 and TRPV2 in mouse heart.Immunohistochemical staining of mouse heart immersion-fixed, free floating frozen sections, using rabbit Anti-SERCA1 Antibody (#ACP-011) (1:200) and Guinea pig Anti-TRPV2 (VRL1) (extracellular) Antibody (#AGP-033), (1:200). 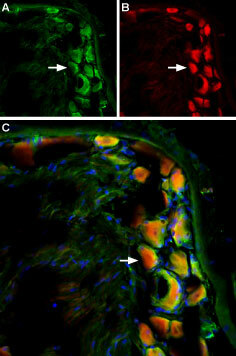 A. SERCA1 staining (green) appears in T tubules (arrows). 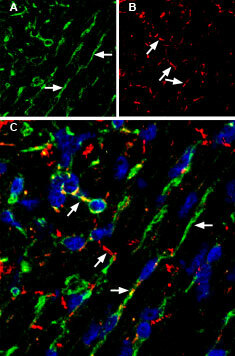 B. TRPV2 staining (red) in same section is detected in intercalated discs (diagonal arrows) and T tubules (horizontal arrow). C. Merge of panels A and B demonstrates co-localization of SERCA1 and TRPV2. Nuclei are stained using DAPI (blue). Alomone Labs is pleased to offer a highly specific antibody directed against an epitope of rat TRPV2. Guinea pig Anti-TRPV2 (VRL1) (extracellular) Antibody (#AGP-033) raised in guinea pigs, can be used in western blot and immunocytochemistry. It has been designed to recognize TRPV2 from mouse and rat samples. The antigen used to immunize guinea pigs is the same as Anti-TRPV2 (VRL1) (extracellular) Antibody (#ACC-039) raised in rabbit. Our line of guinea pig antibodies enables more flexibility with our products such as immuno-colocalization studies, immunoprecipitation, etc. Anti-TRPV2 (VRL1) Antibody (#ACC-032). This antibody recognizes a different epitope and thus can also be used as a control for detecting TRPV2. Anti-TRPV2 (VRL1) (extracellular)-FITC Antibody (#ACC-039-F). This FITC-conjugated antibody can be used to detect TRPV2 in live cell flow cytometry. Anti-TRPV2 (VRL1) (extracellular) Antibody (#ACC-039). This antibody recognizes an extracellular epitope and can be used to detect TRPV2 in live cells. This antibody has been raised against the same epitope as #AGP-033. Anti-TRPV2 (VRL1) (extracellular)-FITC Antibody (#ACC-039-F). A fluorescent labeled primary antibody. It can be used to detect TRPV2 in live cells.